We often come across “the perfect venue”for an event … only to later find out that the site lacks kitchenspace and sufficientresources needed for catering. Whilewe are always able to find warmers,utility racks, and other basic cateringessentials, we could never find a fully-equipped, rentable kitchen. Until we met Kristin Brochert, owner of Trailer Events. 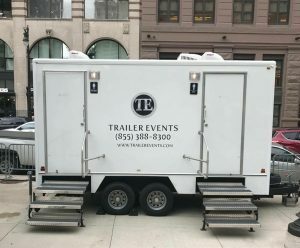 Trailer Events has made it possible for us to bypass what could have been a major event restriction or venue deal breaker and turn the space into a state-of-the-art facility. Originally in the restoration business,Kristin offered a solution for anyoneplanning a renovation project or an emergency situation that required immediate restoration: a mobile kitchen. Her clients were mostly schools, summer camps, and nursing homes. Word got around about these mobile units and it soon became obvious that the private events world could also utilize her brilliant idea of a mobile kitchen. Thus, Trailer Events was born. We had our solution to hosting events in fantastic venues with little or no kitchen space! 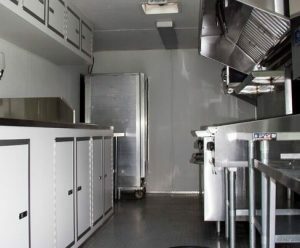 Trailer Events offers a state-of-the-art commercial grade, NSF Approved, and fully licensed mobile kitchen. Each kitchen has a functional floor plan design and includesthe necessary equipment to prepare and serve food in a clean, safe, mobile environment. As Kristin’s business grew, clients began asking for a specialty trailer for tailgating. 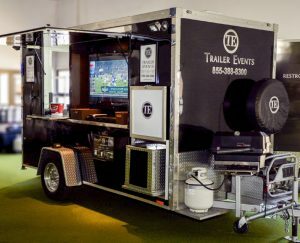 State-of-the art and equipped with a stainless-steel refrigerator, microwave, outside gas grill, generator, and private restroom, these specialty trailers offer a convenient mobile party solution. The trailers are hi-tech with an HDTV monitor, remote, satellite, and Bluetooth capabilities. In response to increased demand for mobile units, Kristin has added executive restroom trailers to her arsenal. We were fascinated by the beauty and functionality of these units. With separate entrances for men and women, the restrooms have private stalls, stainless trim mirrored vanities, hand sinks with warm water, LED lighting, and ventilation complete with heating and cooling systems in place. You never know when you’ll be hosting an event in need of additional restrooms – look no further! capabilities at your next event!